Until now it has been difficult to incorporate a combination mechanism into the round body of a disc lock. Various problems were encountered by manufacturers but now Sterling have successfully created this model. 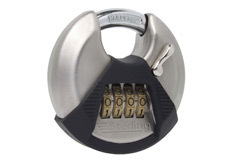 It includes 4 digits which are resettable to your own code, a solid 9mm hardened steel shackle and a rust free stainless steel body. We would still not regard this lock as 100% weatherproof but it will stand up to normal conditions outdoors for at least 3 years before showing signs of rust. Regular lubrication and care will extend it's life for much longer. A soft rubber bumper also ensures the lock is held off the door or gate it is attached to, preventing excessive wear over time. 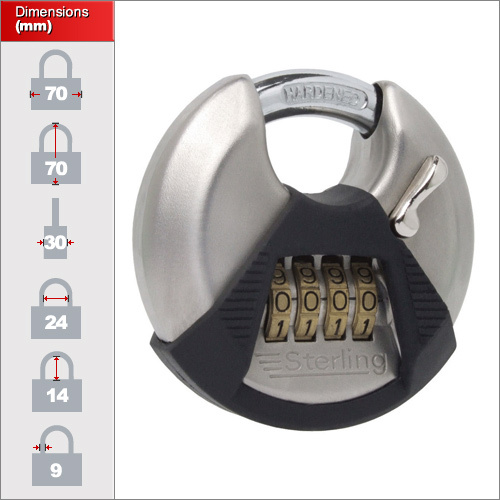 Disc locks have various uses but they are especially popular due to their closed shackle design which makes them highly secure against crow bar and hack saw attacks. They also go very will with a hasp and staple to give even more protection.